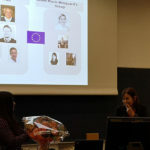 On October 26, 2018, our first Early Stage Researcher within the BonePain network defended her PhD thesis at the University of Copenhagen, Denmark. 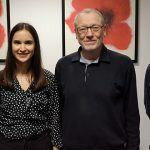 Marta Díaz del Castillo defended her thesis “Underlying mechanisms of malignant and non-malignant bone pain” in front of a numerous family members, friends and co-workers, as well as her assessment committee. The committee was composed of Associate Professor Thomas Levin Andersen, from the Department of Clinical Cell Biology at Vejle Hospital, University of Southern Denmark, Professor Ana Isabel Baamonde Arbaiza, from the Department of Pharmacology at the University of Oviedo, Spain, and the chairman Associate Professor Klas Abelson, from the Faculty of Health and Medical Sciences at the University of Copenhagen, Denmark. Marta focused on three main areas of research in her PhD studies: 1) Painful breast cancer metastases to the bone, 2) a painful cancerous condition of the bone marrow called multiple myeloma, and 3) a rare disease called tumour-induced osteomalacia, in which patients develop benign endocrine tumours that secrete factors altering the bone homeostasis (and ultimately inducing painful bone demineralization). During her PhD studies, Marta has visited several research institutions around the world including Nordic Bioscience, Denmark; Grünenthal, Germany; Cellectricon AB, Sweden and the University of New England, Maine, USA. In her thesis, Marta has focused on the use of animal models and utilized a variety of techniques such as cell culture, immunohistochemistry, calcium imaging and computed tomography, to gain a deeper insight into the mechanisms behind bone pain. Her thesis has provided novel animal models and identified new drug targets, leading to the ongoing publication of four peer-reviewed articles and several collaborations. After a successful thesis defence Marta was awarded with a PhD and hosted a fun reception at the University of Copenhagen where she was surrounded by her closest ones. Good luck in your next career step Marta! 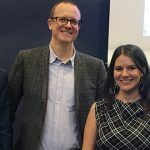 Above: Associate Professor Thomas Levin Andersen, University of Southern Denmark, Associate Professor Klas Abelson, University of Copenhagen, Marta Díaz del Castillo, and Professor Ana Isabel Baamonde Arbaiza, University of Oviedo.